British graphic designer Ross Mackintosh lost his father in 2009 to prostate cancer. Like many artists before him, he turned to art to process the events. In fact, he told Deborah Vankin in an interview for the Los Angeles Times, "I created the comic for myself, as a way of removing pictures and phrases from the maelstrom in my head. 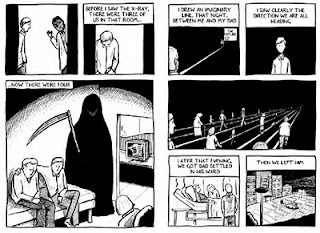 The secondary purpose was a subconscious need to express to my mom and brothers that the awful events didn't just happen quietly"
The medium he chose, however, was not his usual computer based work, but that of cartoon. 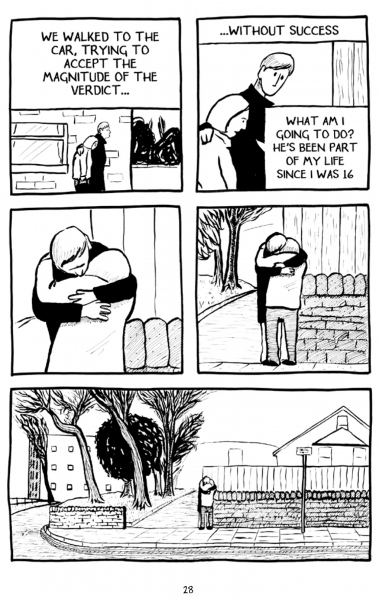 Many of his memories and experiences were so visual that he decided to draw them out. The outcome is a stunning and beautiful tribute to Mackintosh's father. 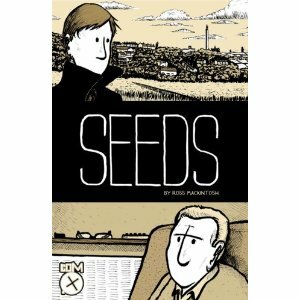 The graphic novel, published by Com.x in April is entitled "Seeds". I was drawn immediately to the images;their minimalist nature serves the heavy topic well. The reader journeys from time of diagnosis to time of funeral. Interspersed in the narrative of the events are deeper concepts such as genetics, relationships and purpose. 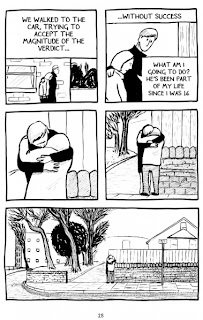 Also accompanying the story are the very real moments of humor and tragedy. It is this combination that allows the reader to connect and perhaps even find their own personal stories in this work. Mackintosh's father spent time in hospice and there is a great conversation where the physician communicates prognosis by saying "When people in your father's position deteriorate monthly, they usually have months to live....When they deteriorate weekly, they usually have weeks to live.... Your father has been deteriorating daily..."
The medium of cartoon really forces the themes and concepts to be whittled down to absolutes... gone is the ability to hide in verbose prose or get lost in mundane details. 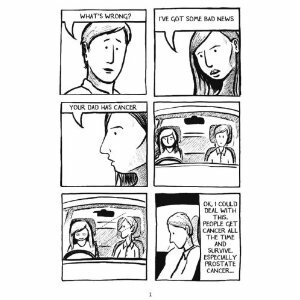 This really makes this graphic novel quite raw, and most of the reviewers I read mentioned reading with lumps in their throats, as the images and few words struck familiar nerves of mortality and loss. This certainly is one that should be considered for our personal and/or palliative medicine libraries and it may very well attract unsuspecting readers going through the experience of loss. All images are Copyright Ross Macintosh.